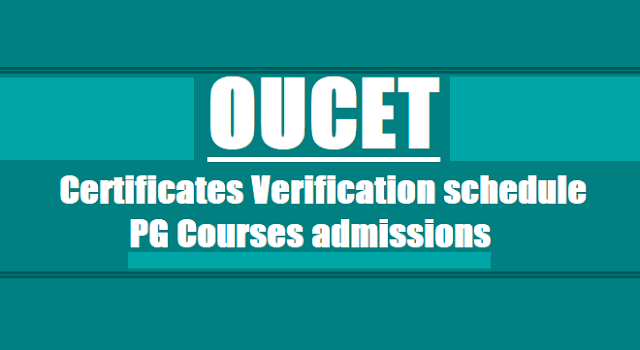 OUCET 2018 3rd Phase Certificates Verification, Web Options Entry Dates /Schedules Notification for 1st,2nd Phase Certificates Verification, OUCET PG Admissions Counselling : All the candidates, who have exercised the OUECT-2018 web options, are hereby informed that the Certificate Verification of the candidates, who are provisionally allotted for admission into different PG courses in different colleges for the academic year 2018-2019 through web based allotment process, will be conducted .. Candidates should note that the certificate verification is only for those candidates who are provisionally allotted an admission through web based allotment process. The provisional allotments are placed in the website. Candidates can check their status of allotment of provisional admission in the website. Without attending the certificate verification, the candidate’s admission into a course will not be entertained and his/her allotment will be deemed to be cancelled. The candidates who are provisionally qualified in OUCET–2018 Entrance Test for admission into following course are required to attend the certificate verification as per the schedule given below. The registration fee of Rs.250/- for OC/BC candidates and Rs.200/- for SC/ST/PH candidates has to be paid by candidate through online payment mode before proceeding to certificate verification, which is mandatory. Only those candidates who paid registration fee are allowed for certificate verification at various centres. The decentralised certificate verification will be available at the following University centres. Candidates can choose any of the following university centres for their certificate verification as per the below schedule. The candidates who are provisionally qualified in OUCET–2018 Entrance Test for admission into following course are required to attend the certificate verification as per the schedule given below. The registration fee of Rs.250/- for OC/BC candidates and Rs.200/- for SC/ST/PH candidates has to be paid by candidate through online payment mode before proceeding to certificate verification, which is mandatory. Only those candidates who paid registration fee are allowed for certificate verification. The Centralised Certificate Verification will be available at the following University Centre as per the below schedule. The certificate verification and admission process for M.Ed. will be notified separately in due course. NCC, NSS, SPORTS, CAP & PH certificate verification will be held in second phase of certificate verification. The National Integration Quota (NIQ) admissions will be held along with second phase of admissions.